I just ordered a few of the Atlas Z turnouts. Has anybody used these yet? I bought the Fast Track Z turnout kit and figuring I built 4 of them correct, I can't get any power to them. Kind of frustrating for now. Has anybody had this kind of problem with Fast Track Z turnouts? Sorry, no experience with Fast Track. But how could you order Altas Z turnouts ? As far as I know, they are not on the market yet. The Atlas turnouts have been available as a preorder for some time now. I ordered two sets back in December. Atlas formally announced the preorders in the April Model railroader so I suspect they are close to shipping. When you say that you can't get any power to your Fast Track turnouts, may I assume you're having problems powering the frog? The frog gets power from the right hand rail in the diverging position and the left hand rail in the normal position. 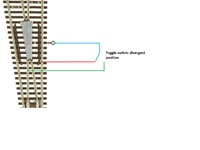 There was a recent article in Model Railroader instructing how to do this and use a toggle switch to mechanically move the points. It would take some fiddling to get the mechanical linkage to work in Z. Since I don't have the Atlas turnouts yet, I can't vouch for how well this solution will work mechanically work. May Model Railroader has a product announcement!!!! The word "preorder" is unmentioned. Zscale Monster has removed "preorder" from their listing and is claiming 2Q18 delivery. Atlas still has preorder on their website. In January Atlas posted this to their Facebook account ... This sounds very similar to what you read in May 2018 Model Railroader ... "product announcement." The May MR probably required content submissions in February. Likely not much more information than this product announcement is in your new issue. The word I had from Atlas two weeks ago (March 30) is that a new set of turnout samples were just brought in-house and if approved, production would start shortly thereafter. The place where it counts is on the Atlas Shop site ... and as of today, they still say "pre-order:"
Thanks. I appreciate the insights. Makes sense. I have a feeling this is related to AFFA's demise. Suppose they had to eat a several hundred thousand wan batch of "defective" switches. The last word from Atlas was that they had to rework tooling and probable production would be in September. Their press release from last week states that track products ARE NOT affected by this plant closure. HOWEVER, it would not surprise me if Atlas management is a little distracted right now, so that could impact things too. 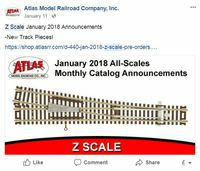 In James Wright’s Facebook live video of the Atlas booth at the National Train Show, it was noted that the new Z scale track offerings are “virtually coming out anytime now” and that they are “very close”. Hopefully the wait will soon be over for those who have long awaited these turnouts. I noticed this morning that the status of these turnouts on the Atlas page has gone from "preorder" to "backorder". Has anyone actually received them yet?